The new Apple Watch Series 2 is packed with features and hardware: a heart rate monitor, a GPS sensor, an altimeter and numerous fitness and health monitoring features are just a few examples. What was not one of the assumptions, however, was a camera, which should be integrated into the Apple Watch Series 2. The users have yet to do without this. 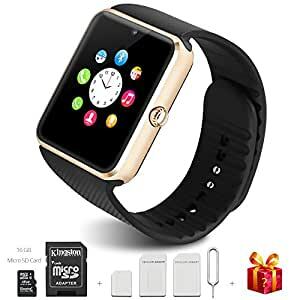 The electronics manufacturer from Cupertino is supposed to work on it and to the extent to which the camera can integrate into the smart clock and thus also to use FaceTime in full extent. Because this will probably still last until the appearance of the next Apple Watch, the Startup Glide has now adopted a third manufacturer of this question. The result is a bracelet that contains two cameras and is called CMRA. At the end of last week, we were able to report the Kardia bracelet for the Apple Watch Series. In addition to the pulse measurement, it should also be able to recognize the heart diseases in good time. Launched in Israel and California, Startup Glide has now developed and introduced a bracelet designed for the Apple Watch and featuring two cameras. One of them has two megapixels and is particularly suitable for self-help and videotelephony. It is located slightly above the Apple Watch and is able to capture the user automatically when it looks at the display of the watch. A little further on the bracelet is an 8-megapixel camera for ordinary shots of other people, buildings, landscapes and other conceivable motifs. Both photos and high-resolution film recordings are thus possible. A trigger is integrated into the bracelet below the display. Many are wondering what they need in the Apple Watch a camera when they have their iPhone. The answer is provided by Glide, as the startup explains that many recordings must be snapped as quickly as possible – if the smartphone is taken out of the bag, the perfect moment is possibly already over. The CMRA bracelet from Glide is very independent and can even be used independently of the Apple Watch. It has a battery that, according to the manufacturer, provides the required energy for several hundred photos or about half an hour of video recordings. All data migrate into the eight gigabytes of memory, which is also integrated into the bracelet. This weighs even 35 grams on the scales and is therefore fully on the average, because many tapes of other Smartwatches are also not much easier. A microphone as well as a wireless module with WLAN and Bluetooth 2.1 support complete the equipment of this innovation. On the Apple Watch is then the CMRA app to install, so the clock serves as a viewfinder. In addition, you can split recordings over the application and make video chats. Pre-orders are now available on the homepage of the manufacturer Glide at a price of 149 USD and thus for a little more than 130 euros. The colors available are white, blue, gray and black. The delivery includes a dual charging module with which the Apple Watch and the CMRA bracelet can be supplied with energy at the same time. This docking station also has a rechargeable battery, so charging can be done even when there is no power outlet nearby. Delivery to the pre-buyers, however, is scheduled for spring 2017. Glide starts so early to get an overview of the demand and adjust the production accordingly. Anyone who wants to have the product sent to Germany has to be patient – so far this is not yet possible. In the future, the CMRA bracelet for the Apple Watch will cost about one hundred euros more than currently. This will pay more than 220 euros.